The nature of my business is catering and fruit art. Zibeths’ came into existence going to 2years now. We started with fruit art before going into catering and finger foods. 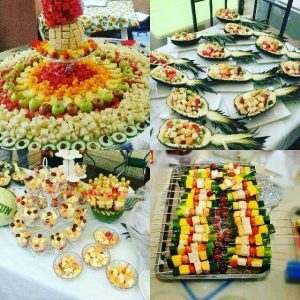 The fruit art is a process of designing fruit into different designs like fruit platter, fruit kebab, fruit tree, fruit bouquet and carving. Fruit art is a beautiful work for a creative person. The catering aspect of our service is cooking for both indoor and outdoor jobs. We cater for events. Also, we are into finger foods like small chops and the likes. My targets are the events planner in the industry. Once you get one good event planner that gets jobs regularly, then you sure of getting jobs for events. I‘m also targeting people in the office for their events or meetings. My motivation as an entrepreneur is to make it big in the industry and to be known as a unique brand. I am also passionate about training the youths to become a boss of themselves. What were the initial challenges you encountered as an entrepreneur? The challenges I experienced as an entrepreneur was fear of the unknown, even before money. Fear plays a major challenge because with fear, you stay stagnant and not move. Because you don’t know what you would meet in front; fear makes you to stay at a spot for long. Another challenge I encountered was funding. With money, you can execute so many plans for your business among which include: branding, logo and adverts. Data connection needed for posting on social media could be a challenge once you don’t have money. Clients and people around a business can also play a major role in that business. I had to be bold by taking bold steps in doing things and also do away with procrastination. That is a major challenge: once you don’t procrastinate, you move forward. I also began to create new ideas because this industry requires you to be really creative if you want to move forward. Presentation also matters a lot in this industry. Something people don’t know is that people digest pictures even before they eat. Young people can improve on themselves by been creative. Once you notice you good at something, go for it, don’t let fear hold you down. Start with something; you don’t need all the millions before you can start. Always go for trainings, keep learning and never stop learning. Be bold and fearless. Also put God first in whatever you do. Let Him be the ruler, the author and finisher of it all.